The operation is expedient to machine a model with horizontal flats. Machining consists of series of horizontal tool passes on miscellaneous levels. Surfaces and meshes defines the machining model. An additional stock value may be set for each geometrical object or objects group. The value will be added to the main stock of operation for machining. All horizontal segments will be recognized automatically during elements adding in the model for machining. At model preview, these segments are drawn by other color for clearness. All other surfaces of a machining model is inspected, as well as restricted model. The rule allows to avoid part gouges. 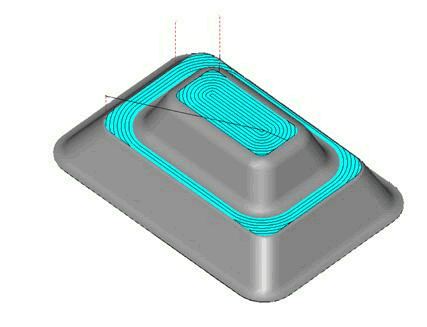 The milling type (climb or conventional) is available during a toolpath calculation. It is possible to skip holes in a machining model the size less indicated, to keep them for further machining (holes capping). Using of finishing pass (by vertical and horizontal) allows receiving more excellence quality of a part surface because of a small previously left finish stock. Material removing may be realized with using of high speed cuts.